On October 5, 2012, the Energy Board of Quebec gave the green light to Hydro-Quebec to begin the Phase 1 of the deployment of “new generation” meters on all buildings in the metropolitan area of Montreal. Then on June 13, 2014, it approved their deployment elsewhere in Quebec, after refusing to reconsider the health effects of the radiofrequency emissions (pulsed microwaves) of these devices, despite the hundreds of testimonies it received about this, and without ordering an impact study, despite repeated requests to that effect. In fact, hundreds of thousands of Quebecers are very concerned about the effects on their health and that of their family from continuous exposure to these powerful pulsed emissions, with peak emissions exceeding 50,000 microwatts per square meter (µW/m2). This was revealed in a Leger Marketing poll in early April 2014, with 500 respondents from the Greater Montreal, since 63% of them have indicated their concern about this. In addition, 52% of the citizens polled were opposed the continued deployment of these devices if an impact study isn’t performed first to determine whether or not they are harmful to human health. Alas, like Hydro-Quebec, the Energy Board of Quebec does not care, it seems, since its core mandate is to review the requests from this Crown corporation mainly as to their financial impact on its profitability. 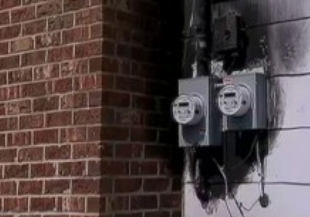 And as a matter of fact, because this type of device is precisely designed to allow for time-of-use pricing, 73% of poll respondents fear, once all the meters are deployed, that there will most likely be a rate increase at the times of peak electricity consumption, which could inflate their utility bill by 15 to 20%, as occurred in Ontario and elsewhere. Worried about having those pesky counters imposed upon them against their will, many citizens have mobilized and, notably, received support from their municipal council in this very unequal struggle. To date, over one hundred municipalities (111 as of August 26, 2014), representing more than two million Quebecers have called for a moratorium on their deployment and/or a free opt-out. Considered to be exorbitant, unfair and punitive damages ($17 per month plus $98 initially), the fees for a “non communicating” meter (with no radiofrequency transmitter) are only intended to deter customers from opting-out. That didn’t stop more than 5600 households to do so, as of May 1st. And that’s not counting the tens of thousands who managed to prevent installers from taking away their old and safe electromechanical meters, which are apparently three times more durable than those fragile “smart” meters, that will need to be replaced every 15 years. However, due to the numerous pleas it received, Hydro-Quebec has agreed to reduce its opting-out fees which, once approved by the energy board, would be $48 for the installation of a non communicating meter and $8 per month for manual meter reading of the electricity consumption – all the details HERE. It’s not free as requested, but at least the efforts of opponents will not have been wasted! And the pill will be less hard to swallow for the 1.8 million customers who already had these dangerous devices forced upon them, and who want to get rid of them. Nevertheless, one must know that the World Health Organization has classified those radiofrequencies (RF) as “possibly carcinogenic to humans” in 2011, and thousands of independent scientific studies have also shown that repeated exposure to low RF levels can be genotoxic (DNA breakage) and neurotoxic (various neurological consequences). If Hydro-Quebec is so adamant on imposing this technology, it is because it can hide behind Health Canada’s Safety Code 6, its outdated RF exposure guidelines adopted in 1979. Indeed, this Code 6 recognizes only thermal (warming) effects from RF and ignores the biological effects observed at exposure levels as low as 100 µW/m2 (maximum recommended within a house by the Council of Europe). Health Canada claims that there is no possible biological effects below the 6 million µW/m2 permitted by the Code 6, while countries like Switzerland, Italy, Russia and China have adopted exposure limitations much more stringent, in order to abide by the precautionary principle. But the problems with this technology don’t stop there. With the highly detailed power consumption data these meters send to Hydro-Quebec, it is possible to draw a clear picture of our lifestyles and even of the types of devices we own. Despite their encryption, hackers, and even the Royal Canadian Mounted Police (RCMP) or the National Security Agency (NSA) could get their hands on this data, and thus be able to surreptitiously monitor our every move within the sanctuary of our home. In addition to being a potential violation of privacy and a serious health risk which, in the long run, could multiply the number of cases of the nightmarish electromagnetic hypersensitivity (EHS), these devices have the tendency to catch fire when their built-in protection against power surges fails. The EMF Safety Network compiles the cases of smart meters that have caused fires. Jean Hudon is the co-founder and webmaster of the Coalition québécoise de lutte contre la pollution électromagnétique (CQLPE – Quebec’s Coalition Against Electromagnetic Pollution), and a member of the organizing committee of the campaign Je garde mon compteur.